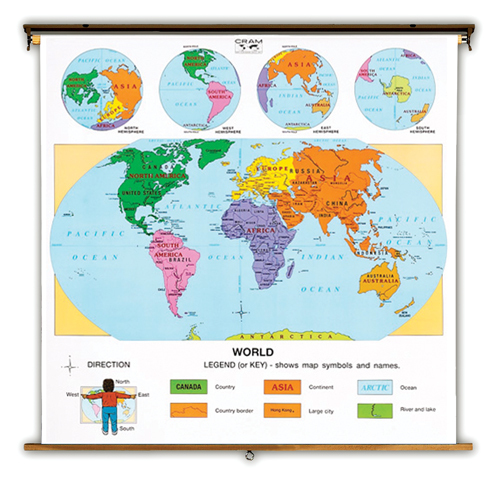 The perfect way to introduce the World Map to young learners. The brightly colored continents will keep the students attention while teaching basic location skills. The legend is simplified to make it easy to understand. The map utilizes the Winkel Map Projection which is recognized as providing the best balance of size, shape, and direction. The most accurate map available! There are also the four hemispheres shown as inset maps at the top of the map. Printed on non-tear material, and mounted on heavy duty spring roller in brackets with backboard. 51 inch x 57 inch . Markable.